Spring Break has come and gone, and while these days it's more about sand castles and sunscreen than tanning and tequila shots, I wouldn't change a thing. Typically for Spring Break we just hang out at home. It always falls on Master's week here in Atlanta, and for most of the week Mr. Cute is living a golfer's dream amidst golf's elite, pimento cheese, and azaleas (both of the floral variety and the cocktail variety). The week's leading up to Spring Break were cold and rainy and not very spring like at all. About a week out, I turned to Mr. Cute and said, "I need some sun! Send me somewhere. Anywhere. As long as it's above 75 degrees." Being the smart husband that he is, he instantly got on his computer and started seeing what travel magic he could work last minute. One because he knew it would make his family happy and entertained while he was away in Augusta. Two because he knew this would probably buy him a free pass later in the year, and he does love a good man-cation. 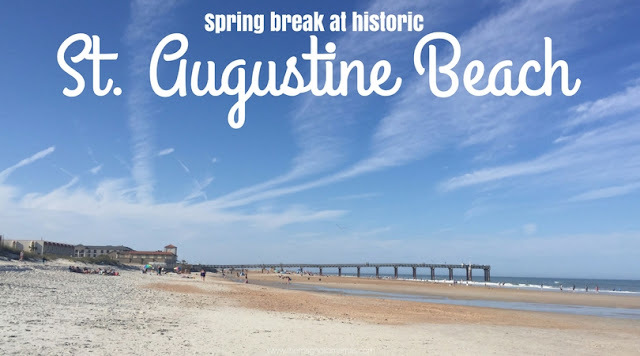 The week before we released school for Spring Break he sent me an email confirmation for St. Augustine, Florida. I had never been, but it was a warm beach with in reasonable driving distance from Atlanta. I was in! Rarely am I ever so spontaneous in trip planning, but as a tried and true southern girl I just could not stand the thought of spending any more time in cold, rainy weather. In April. It's against southern religion or something. By now we are typically decked out in our flip flops, and made all of our great-grandmother's roll over in their graves for breaking the "no white before Memorial Day" rule. Spring Break arrived. Easter came and went. I backed our bags, sent Mr. Cute happily along to live out yet another week in golfer's paradise, and made my way south to St. Augustine Beach. 5 days. Three kids. One mom. And a last minute guest (my middle sister). It made for crazy fun adventure right from the get go. We discovered new places, had tons of laughs, and all fell in love with parts of St. Augustine. Booking a trip last minute at the height of spring break season didn't leave many options. Part of the reason we ended up in St. Augustine was because there was hotel availability so last minute. Our home for our week in St. Augustine Beach became the Hampton Inn on A1A. Side note: Anytime someone mentioned A1A my mind automatically trailed to Vanilla Ice. I often found myself singing the song in my head after someone mentioned it. I can't be the only one? We are Hilton Honors members so we are familiar with Hamptons. They are usually easy, clean and convenient. Plop that directly on the beach and I had no complaints all week. Because we booked last minute, rooms were limited and the only room available was a King Suite with a whirl pool tub. Luckily a few of my travel companions thought a fold out couch bed was their idea of fun (ah, the joys of childhood), and the whirl pool tub might have been one of their favorite parts of vacation. Our room came with a large balcony and a gorgeous view. As a last minute getaway place to stay it ended up being perfect. The drive from Atlanta to St. Augustine Beach took us about 7 hours with traffic and a few stops. 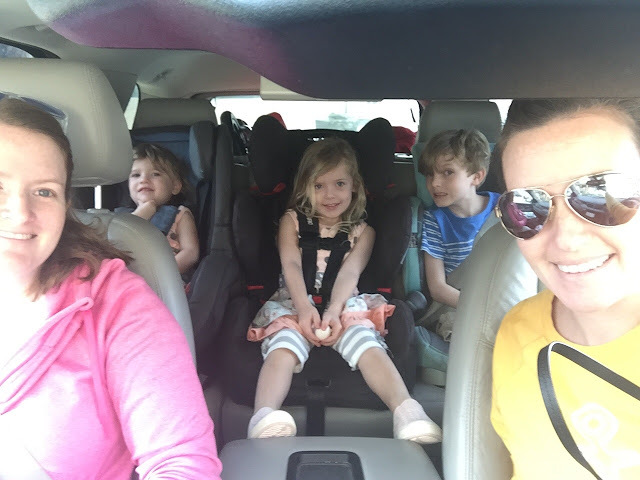 Using some of our favorite travel tricks with kids, the road trip went pretty smoothly. Especially when you throw in a Chick-fil-a stop or two into the mix. We arrived at the hotel by late afternoon, and after a quick check in we headed right back out the door to soak in what we came for...THE BEACH! The kids loved getting to stretch their legs in their happy place. We let them run, play in the sand, splash in the tide pools, and gather the first of approximately 1,456,749 shells for about an hour and half before heading to dinner. Our hotel was located directly across from a large restaurant called the Sunset Grill. We hopped across A1A (Beachfront Avenue! Sorry...I couldn't help myself.) to check it out, but it was packed and had over an hour wait. So we hopped back across the street and drove a few blocks down before we spotted Obi's Fillin Station. It was small, served burgers and french fries, and had less than a 15 minute wait so we settled in. The kids loved this place. They kept calling it the Cars restaurant. It was themed with classic cars from the decor down to the menu. I didn't take any photos beyond this point because the service became a little slow, more so due to our waitress than the entire restaurant. The kids deteriorated pretty quickly and the minute the check was paid, I put the entire crew to bed. But knowing this was our view for the next few days, I knew we hit the beach running bright and early for day two. Stay tuned for more tomorrow! Have you been to St. Augustine? I can't wait to go back! What are some of your favorite things to do there?